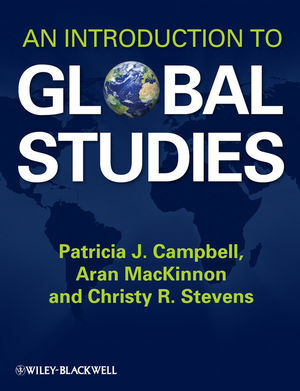 Taking an interdisciplinary approach, An Introduction to Global Studies presents readers with a solid introduction to the complex, interconnected forces and issues confronting today's globalized world. Patricia J. Campbell is Professor and Program Director for International Relations and Middle Eastern Studies at American Public University. She is the co-editor of Democratization and the Protection of Human Rights: Challenges and Contradictions (1998) and has written numerous articles and chapters in books and scholarly journals, including International Feminist Journal of Politics and Journal of Political Science Education. Aran MacKinnon is Professor of History and Director of Interdisciplinary Studies at the University of West Georgia. He is the author of The Making of South Africa: Culture and Politics (2004) and numerous scholarly articles as well as co-editor of a special issue of the interdisciplinary journal, Studies in the Social Sciences (2005). Christy R. Stevens is the University Library's Information Literacy Coordinator at Cal Poly Pomona. She has published several articles focusing on information literacy in the political science and global studies contexts, including articles in Journal of Political Science Education and Reference Services Review.